One of the repeat requests I’ve gotten is for outfits that specifically don’t accentuate the belly. I’ll admit that pre-pregnancy, I almost always tucked my tops into high waisted bottoms (in order to highlight the waist), which may not always be comfortable or flattering. 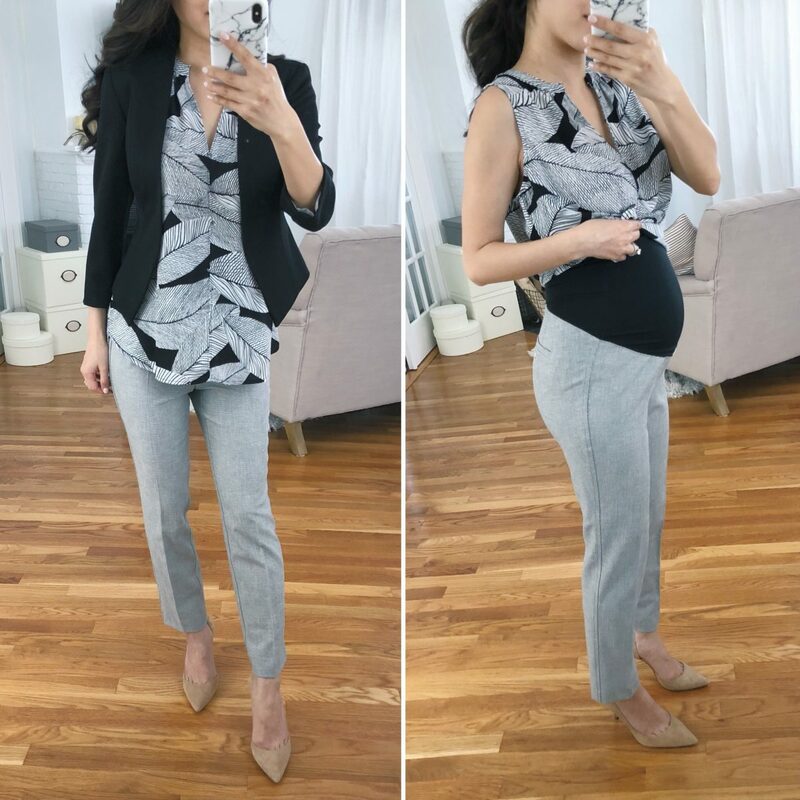 So whether you just want to cover up your midsection, or if you’re newly expecting and don’t want colleagues to know just yet, here are a few simple “camouflaging” tips! Cropped blazer + untucked, printed A-line blouse + elongating pants. You’d be surprised at how much a drapey blouse in a large, bold print can camouflage! For reference, I’m over 5 months along in these snapshots. To add back some waist definition, I like shorter blazers like these that nip in at the front center, creating the slight illusion of a narrower waist. 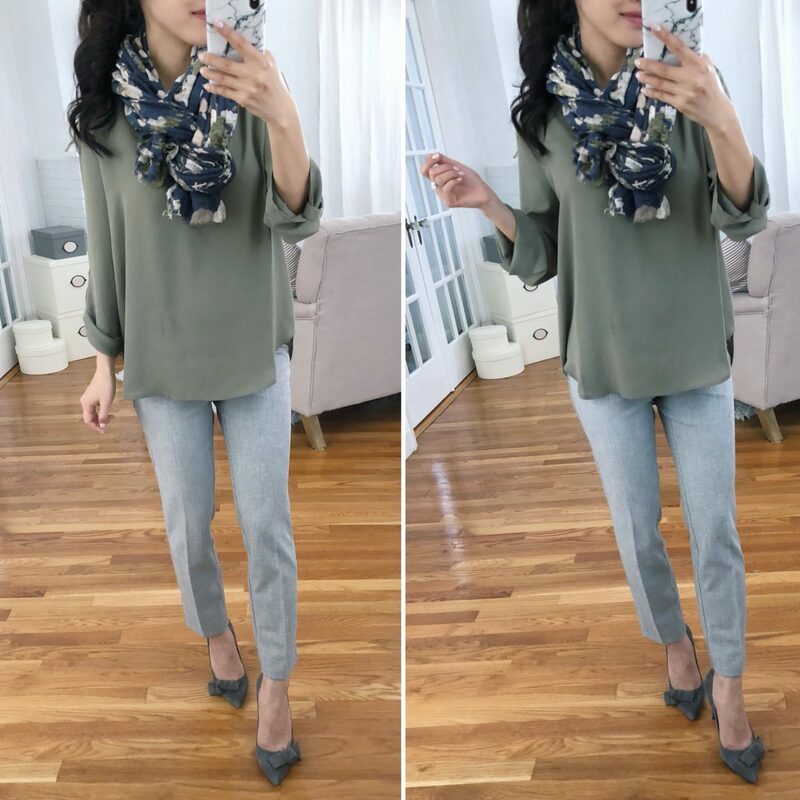 For pants, I’d stick to a slim ankle silhouette (above) OR a floor-length boot cut trouser (below) to help lengthen the rest of your body. 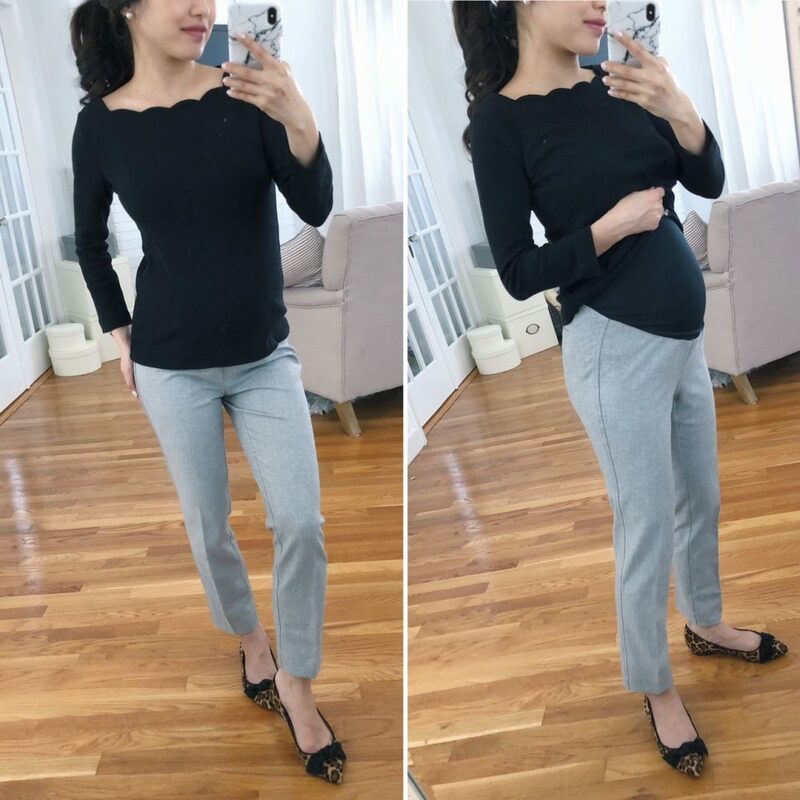 As mentioned in my recent reviews, I found LOFT maternity work pants in petite sizing to run a little small (especially at the belly band area) – I’m trying on 1 size up from my pre-pregnancy size in both pairs here. This won’t work wonders if you’re further along, but pairing a jacket over a blouse of the same color will add some layered dimension and take some attention away from the belly. I first featured this tunic in my Seattle post, and swear I still look exactly the same in it despite week after week of belly growth! It’s cut generously in a very lightweight / non-clingy maternity, which is key for the blouse to skim over your stomach. If you are not pregnant, size down if possible otherwise this might be too big. Even though this is a semi-fitted tee, black + a longer length can be magic. I also like the general theme of interesting accessories or details (like this wide scalloped neckline!) that draw the eyes upward. So this is not for work, but this was one of my favorite tops (so soft & comfy!) from pre-pregnancy that’s still getting good wear! You might think the detailing would accentuate the belly, but all the twists and drapes camouflage that area rather well. Note it runs pretty short, so if you’re petite and buying it while expecting, I’d suggest trying regular sizing or one size up in petite for a little longer length. On a baby bump, I think it looks best when the twist knot detail fully falls below the belly. Check out Uniqlo maternity leggings. I found them to be quite comfortable. They didn’t fit me but I can see how they’d be very comfy on others! Wow, your outfits are super cute! 🙂 You make maternity outfits soo pretty, Jean! <3 Definitely going to forward this post to my cousin, who is pregnant as well! She's been having some troubles on what to wear to the office lately, so this will definitely be great help <3 Thank you so much for sharing! These outfits are gorgeous Jean! I love the different options! Your blog is always very motivational and Inspirational for me! Some great options! Sometimes a girl’s gotta hide that belly! Im only about a week or 2 ahead of you in my pregnancy but I feel massive compared to you. Struggling to find anything to wear to work. Have a few maternity clothes but don’t want to buy loads. Your looking great and hope you are feeling it too! Aww congrats, Neha! I feel like every pregnant lady feels massive around now and it only progresses from there. I think if you size up at LOFT, especially with some of their swing-fit dresses and tops it might work and you can still wear them post-pregnancy. Pregnant rimes here with elegant! Superb! That is really some styling magic right there! Great post as always. This is the first pregnancy I’m actually interested in buying mat clothes instead of wearing hand-me downs and buying it out of functionality. 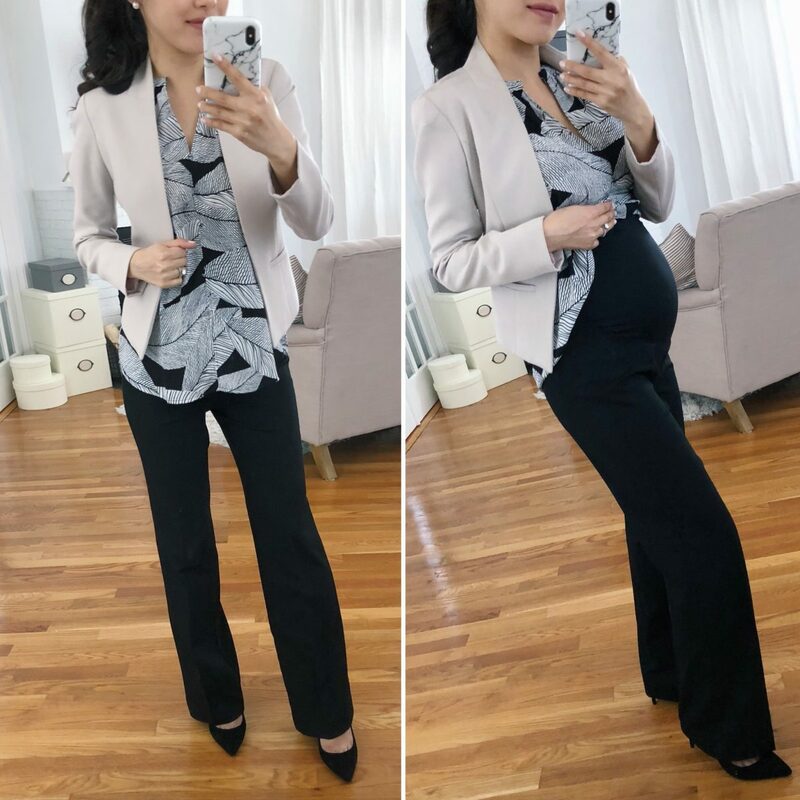 It’s so tempting to purchase online after reading your posts because you look amazing in your outfits and now I feel like I can potentially wear it beyond my nine months…like the first few months post-partum. So far, I’ve purchased the I&I active pants and belly bands and now a few LOFT pants. The active pants have a good thickness to them like you mentioned and I think I’ll grow into the band part. For the belly bands, I use it to brace my abdomen because I can’t seem to get my pants to stay up with just the band while my pants are unzipped. Thanks for your recommendations and styling tips for concealing a growing bump! I’m looking forward to more of your mat clothing posts. OMG!!!!! Congrats! So excited for you on …is it baby #3 after the twins? Hope you are doing well, mama! Thanks Jean and good memory with remembering the twins. This is baby #4. I was thrilled when you announced your pregnancy, but I hadn’t anticipated I’d be joining you for the journey. I love hearing about your pregnancy and think it’s great you’ve been able to travel too! Beautiful ideas! I’d love it if you could demonstrate how you tied the scarf in #3. Great tips and wonderful way to camouflage the belly. I love your grey twist knot sweater. So perfect! Hiding or not hiding , I’m always surprised that we strange people, want to hide nature . People freak-out when a Mother breast feeds . I love 💕 your blog Jean , but don’t hide celebrate. Happy becoming a Mother, Mother’s Day. Do you have a reccomendation for what type of bra to wear with the scallop cami (https://factory.jcrew.com/p/G3367) do you just go with a strapless & if so does it stay up alright with the band extenders you posted? I have a pregnant cousin. She’s been having some troubles on what to wear to the office lately, And i want to share it with her. I think this article will be super helpful for her. I also think that your blog is very motivational and Inspirational for every pregnant women. If you had more insight i will greatly appreciate it. Thanks for the sharing such a helpful article.